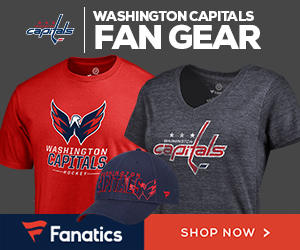 This season, Monumental Network is giving back to all you dedicated DC sports fans with a program called Monumental Rewards for season ticket holders of the Caps, Mystics, and Wizards. The more events you partake in, such as games, conventions, etc. the more points you receive. Then, you can redeem these points for memorabilia, merchandise, VIP experiences, and use in auctions for highly-valued items and experiences. Why do we care? Because there’s an option to pick up an exclusive Mike Green bobblehead! The Green whacky wobbler is sporting his away uniform and can be yours for a measly 1000 rewards points. However, you must act fast as each reward has a limit on how many you may redeem in a certain period of time: Only one can be redeemed between 9/4/2013 and 10/31/2013. As the season progresses, be sure to keep an eye on this rewards program because there are some really great items that can be enjoyed by the whole family. Just make sure you don’t miss out on this one-of-a-kind bobble that will make a great addition to any collection. Check out the rewards program, and check out the other items you can get.